Are military metaphors such as "battling" always appropriate when it comes to cancer, asks Andrew Graystone. In the summer of 1971 the US government was under pressure. After 10 costly years of deployment in Vietnam the public appetite for war was evaporating and President Richard Nixon was beginning to withdraw troops. It was against this background that on 23 December 1971, Nixon signed into law the National Cancer Act. He committed $1.5bn to what became known as "the war on cancer". Having failed to subdue the Viet Cong, Nixon hoped that taking on an enemy that directly affected millions of Americans would deliver him the most significant victory of his presidency. Nixon didn't defeat cancer of course, but he did transform the rhetoric we use to talk about it. Up to that point cancer had been a shameful secret in many families. Often cancer patients weren't even told what they were suffering from. Film actor John Wayne coined the phrase "the Big C" to avoid naming the disease. But through the 1970s cancer gained a new vocabulary. For 40 years the language of warfare has dominated cancer discourse. We have given cancer a personality and made an enemy of it, so that today it's commonplace to speak about battling cancer, fighting cancer, even kicking cancer. Oncologists are painted as heroic warriors, the SAS of the medical world - sometimes fighting hand to hand with scalpels, sometimes using lasers, ray guns and chemical weapons. In reality, cancer is a collection of many different diseases, but we have turned them into a single adversary. It's probably no coincidence that this has happened at a time when the US and the UK have been engaged in the equally abstract and seemingly unwinnable War on Terror. The language of warfare can work well for cancer research organisations. In the competitive market-place of charities they need to create simple campaign messages to evoke a response. Natasha Hill, from Cancer Research UK, says that donors respond well to messages that personify cancer and treat it as an enemy. 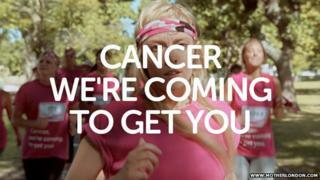 So the advertising agency that designed Cancer Research UK's recent Race for Life campaign wanted to turn their traditional sponsored runners into "an army who run, dance and sing all up in cancer's stupid stupid face with the new line of Cancer We're Coming To Get You". There are effectively two cancers. The objectified cancer of the campaigns and research programmes exists only in the abstract, and it has been so stubbornly unbeatable that it's taken on a mythical status. It offends our evolutionary optimism - the sense that whatever is bad in the world will eventually be defeated by human skill and ingenuity. Perhaps it's not going too far to say that the war on cancer is actually a battle against death itself. But the individual, personal cancer that around a third of us will experience is different. Some people who have cancer find the language of battle useful - but not all of us. Some of us need new metaphors that come closer to our own experience. When I was diagnosed with cancer four years ago, the language of warfare jarred with me. It was partly because I'm not really the fighting kind, and partly because, frankly, there wasn't much that I could do to fight my cancer. Like most cancers, mine was out of reach. I couldn't see it or touch it. I couldn't operate on myself or prescribe medication. My chief aim was to live well with cancer, and then hopefully to live well without it. And yet I felt a strange expectation that I should declare civil war in my body. These were my cancer cells - part of me that I had unwittingly created. I found it hard to like them, but I didn't feel it would help to turn my body into a war zone. I don't like all the parts of my body equally, but as a rule I try not to hate any of them. Prof Michael Overduin, of Birmingham University, researches cancer at a molecular level. He knows that talk of designing "warheads" to target cancer cells with minimum "collateral damage" has an immediate appeal to funding agencies. But he sees his work as more of a puzzle to be solved than a battle to be won. "Cells work together like the players in an orchestra playing a symphony," he says. "But if a cell is malfunctioning it produces dissonance. The instrument may need to be retuned or the cell retrained." Poet and priest Jim Cotter describes his cancerous bone marrow as like a garden that has become overgrown with weeds. The weedkiller that takes out the weeds also damages the healthy plants. But with luck the good plants may re-grow. St Francis of Assisi - who had long-term illness himself - is said to have spoken about Sister Illness. He embraced his illness like a family member. For me, cancer arrived as an unwelcome lodger, parking itself in the back room and demanding attention. For three years I tried to be a courteous if unwilling host. Eventually the time came to invite my cancer to leave. She has left the place in a bit of a mess, and I'm conscious that she has kept the key. Still I'm hopeful that in due course all I will be left with is the rich memory of time spent with a stranger I never expected to meet.